Many incredibly valuable and historical diamonds have been discovered in South Africa, where Graff has the largest facilities for polishing gem quality diamonds. A magnificent rough diamond weighing 218 carats was acquired from local South African diggings. Its beauty even in the raw state was astonishing. The light glowed warmly from within its octahedral shape, reflecting softly off the crystal facets, hinting at the fire and brilliance hidden within its unexplored depths. Nature had provided the raw material, man's skill and expertise transformed and burnished this noble treasure from the earth into its final glorious splendour. Its metamorphosis from a rough crystal to a gem of magnificent grandeur is also a story of people who recognized the alchemy of this living organic crystal and captured its magic in a jewel of timeless beauty. The rarity and value of this rough diamond required the most experienced and skillful craftsmen whose intuitive feeling for the stone created the magical synergy allowing them to discover the secrets within. The Sarah's rough lemondrop-like form, the cutting process, and the finished stone. as possible, with great results. The pavilion of the stone is radiant cut, giving it explosive brilliance. Diamond cutting is a stressful, time consuming and precise operation. The responsibility of cutting a stone of this calibre is enormous and it was decided that genius master cutter, Jean Chandesais, was the man to provide the mastery cutting skills to obtain such perfection, together with a high 70% yield. The high yield isn't too uncommon in the world of diamond cutting, but because the rough amd resulting stone was so large, it is definitely notable. Moreover, since 70% of 218 carats is 153.60 carats (with the weight of the Sarah being 132 carats), it is probable that one or two smaller stones were also cut from the rough. It was estimated that the rough stone would take approximately 16 weeks to polish. Finally the polishing wheel was prepared for the closing steps in the metamorphosis of this exceptional stone. A mixture of oil and diamond dust, gathered from the mother stone during the polishing process, was spread onto the wheel and like a butterfly emerging from its chrysalis this magnificent Vivid Yellow Diamond was burnished by its own discarded skin. For the last time the stone was gently cleaned and carefully placed on the scale. Its finished weight 132.43 carats. The anxious hours of watching and trepidation as the diamond unfolded its secrets were swept away in a wave of relief and jubilation. Finally with great pride, the name GRAFF was inscribed on its girdle, together with its GIA indentification number. A close-up of the Sarah. The lustrous beauty of "The Sarah," transcended the most profound imagination. At last the fiery spirit of the diamond revealed a glittering brilliant gem, scattering sparks of iridescent fire from deep within its heart, encapsulating the earth's very sole in a tribute to man's consumate skill. 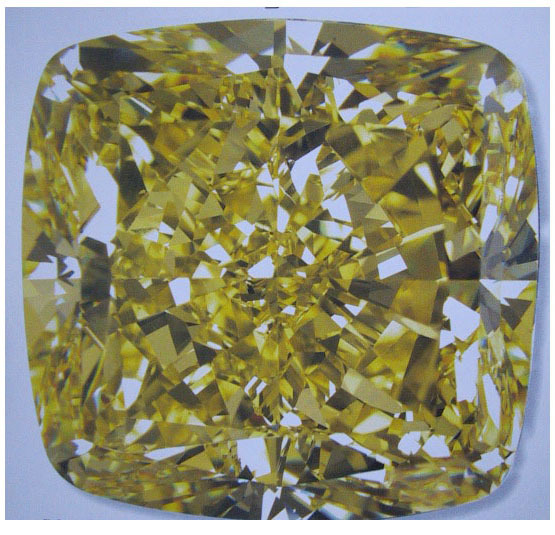 It was not however until December 12th, 2000, when the Gemological Institute of America finally granted its coveted Certificate: 132.43 carats, Natural Fancy Vivid Yellow, VS1, Very Good polish, Very Good symmetry, together with a report stating that it is the largest Natural color Fancy Vivid Yellow Diamond ever graded by them, that its magnificence could be revealed to the world. Laurence Graff has set an unsurpassed standard of excellence and innovation in the world of diamonds and fine jewelry and it has already been said that more important gem quality diamonds have pased through his hands than any other living dealer. Source: graffdiamonds.com and various articles on the internet and in magazines. Amoung the famous diamonds that Graff has handled over the years are the Idol's Eye, the Porter Rhodes, the Emperor Maximillian, the Windsor Diamonds, the Golconda 'D', and the Paragon.